Kouign in the native Breton language means cake and Amann, butter. There’s no better way to describe this decadent cake unless the natives of Brittany add the local word “flaky” to the mix. Invented in the 1800s, this riff off of laminated “Viennoiserie” doughs, like croissant and Danish, adds sugar to the mix so that the flakes also caramelize. There’s so much sugar, in fact, that the ratios should be as close to 40% dough, 30% butter, 30% sugar as possible. In a mixing bowl, whisk together the flour and yeast. Set aside. In the bowl of a stand mixer fitted with the dough hook attachment, add 1 cup room temperature water, maple syrup (or sugar), and salt. Whisk to combine. Add the flour mixture and mix to just combine. Add the soft butter and continue mixing until the dough is smooth and slightly tacky, about 8-10 minutes. Spray a mixing bowl with non-stick spray. Add the dough and spray the top of the dough as well. Cover with plastic wrap and allow the dough to double in size at room temperature, about 1 hour. Press the dough into a rough rectangle on a parchment-lined sheet pan and cover with plastic wrap. Refrigerate for 30 minutes. In the bowl of a stand mixer fitted with the paddle attachment, add the butter, sugar, flour and salt. Mix until smooth. 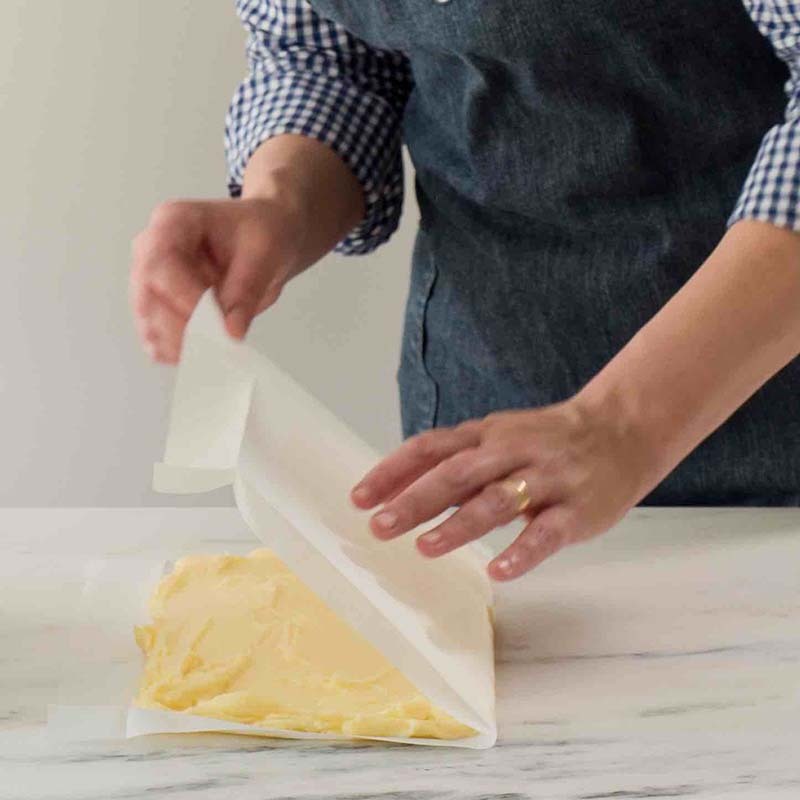 Transfer the butter to a piece of parchment and spread into a rough 12” x 7” rectangle. Fold the parchment over the butter into a little package and smooth out the butter with a rolling pin. Refrigerate the butter block until very cool but not so cold that it breaks when bent. Lightly sprinkle your work surface with flour. 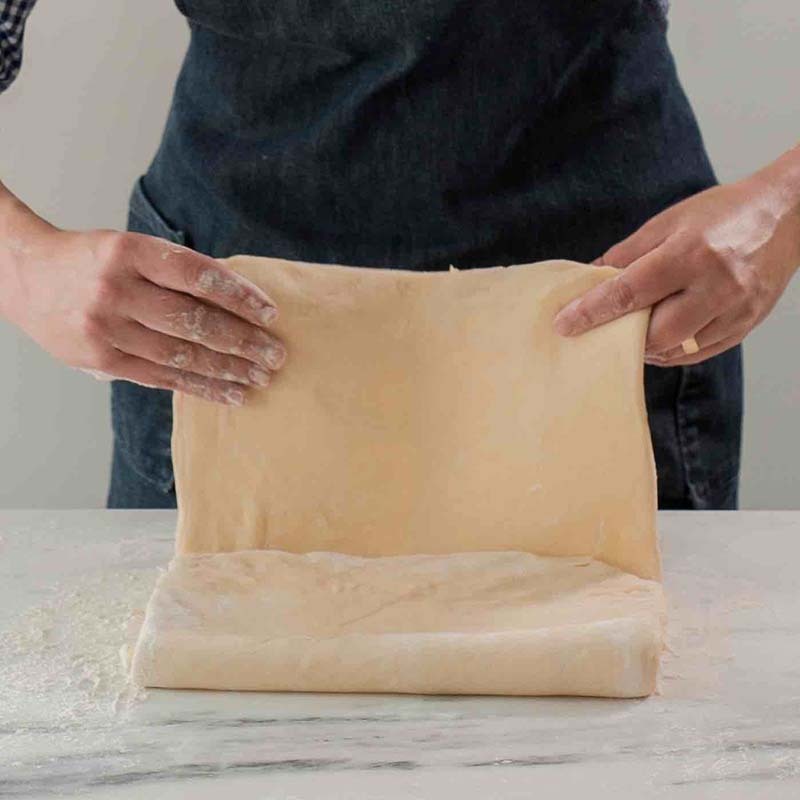 Roll out the dough into a 20” x 8” rectangle. Unwrap and place the butter block onto the 2/3 of the dough. Fold over the uncovered portion of dough onto the butter block, to cover half the butter block. Fold the exposed butter portion over, as you would a business letter. Press the edges of the dough together to “lock-in” the butter. Rotate the dough block 90º and roll out into a 24” x 10” rectangle. Sprinkle the surface of the dough block with 2 tablespoons of sugar and gently press to adhere the sugar. Fold the rectangle like a letter, into thirds. This is called a “letter” or “single” fold. Cover with plastic wrap and place in the freezer for ½ hour and then transfer to the refrigerator for ½ hour more but no more than an hour. Lightly sprinkle the work surface with flour. Orient the dough block so that the “flap” is facing to your right. Roll out into a 24”x10” rectangle, sprinkle the surface with 2 tablespoons sugar and gently press to adhere the sugar to the dough, and make a “letter” fold as before. Turn the dough 90º, roll the dough into a 24”x10” rectangle, sprinkle with 2 tablespoons of sugar and gently press, and perform a letter fold. Wrap the dough in plastic wrap and freeze for 30 minutes and then transfer the dough to the refrigerator for 30 minutes to 1 hour. Lightly sprinkle a work surface with flour. Roll out the dough into a slightly larger than 16”x16” square. Trim the sides so that the square is exactly 16”x16”. Cut the dough into 16 squares. Sprinkle the squares, top and bottom, with ½ cup of the sugar, pressing gently to adhere. Take each square and press the four corners towards the center to create a little parcel. Place the parcels on a parchment lined sheet pan and cover well with plastic wrap. Refrigerate overnight, 8-12 hours. Preheat the oven to 375ºF. Spray a muffin tin with non-stick spray. Place the dough packets into the muffin cups, baking the kouign amann in batches if you don’t have multiple muffin tins. Sprinkle tops of the cakes with the remaining sugar. Bake for 25-30 minutes or until the tops are deeply golden brown. Immediately remove from the muffin tins and allow to cool on a cooling rack. 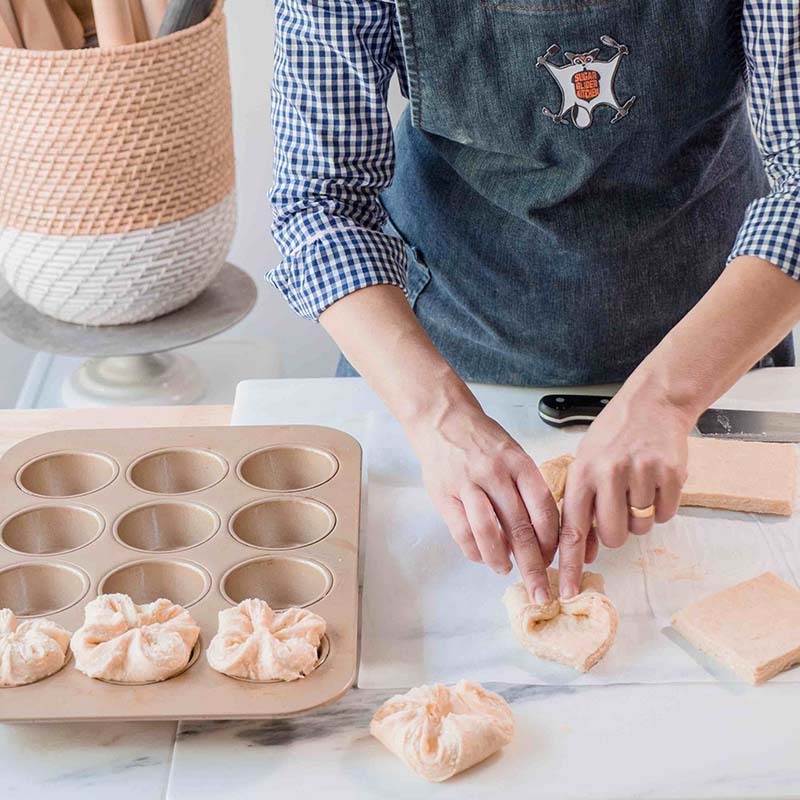 Kouign-amann (pronounced KWEEN-amann) has become a fixture at high-end bake shops from coast to coast. 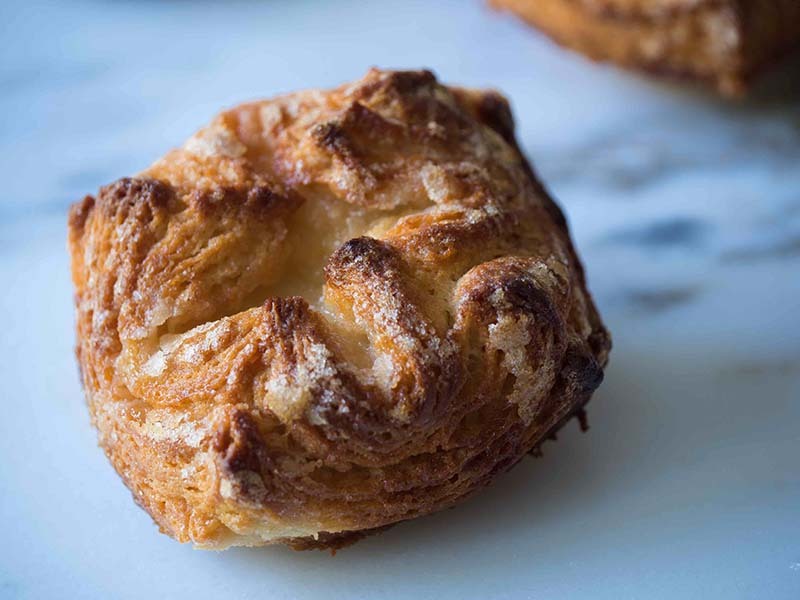 Tender, flaky, buttery and sweet, kouign amann is a croissant relative that hails from Brittany in northwestern France. It's main difference is the sugar between the layers, which results in decadent, caramel-coated flakes that are impossible for mere mortals to resist. Start with the dough. 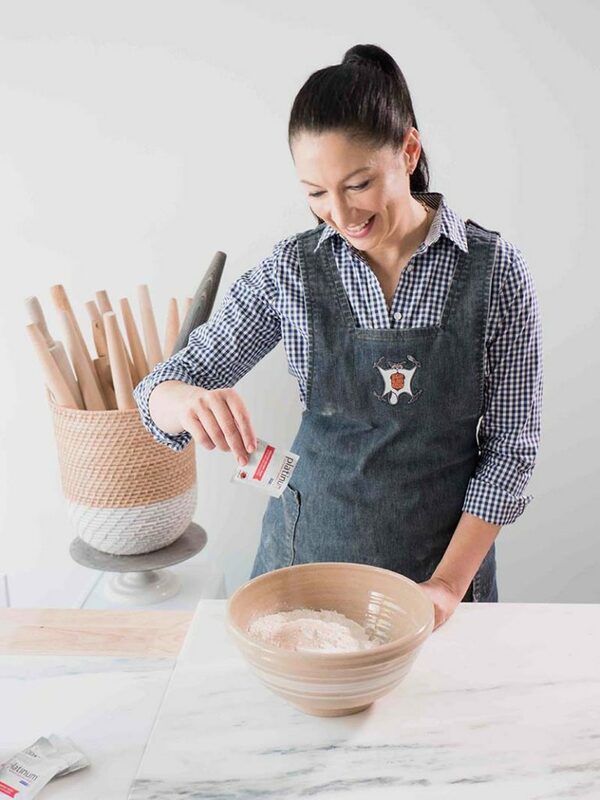 In a medium bowl whisk together the flour and yeast. Next, in the bowl of a stand mixer fitted with the dough hook, combine the water, maple syrup (or sugar), and salt. Add the flour mixture and the butter and mix until the dough is smooth and slightly tacky, about 8-10 minutes. Move the dough to lightly oiled bowl, and cover with plastic wrap. Let rise until doubled, then press the dough into a rough rectangle on a parchment-lined sheet pan. Cover with plastic wrap and refrigerate for 45 minutes. smooth. Transfer the butter mixture to a piece of parchment and spread it into a flat, 11x7-inch rectangle. Fold the parchment paper up and over the butter, making an 11x7-inch package. Refrigerate the package until very cool but not so cold that it breaks when bent. Now for the laminating. Dust your work surface with flour. 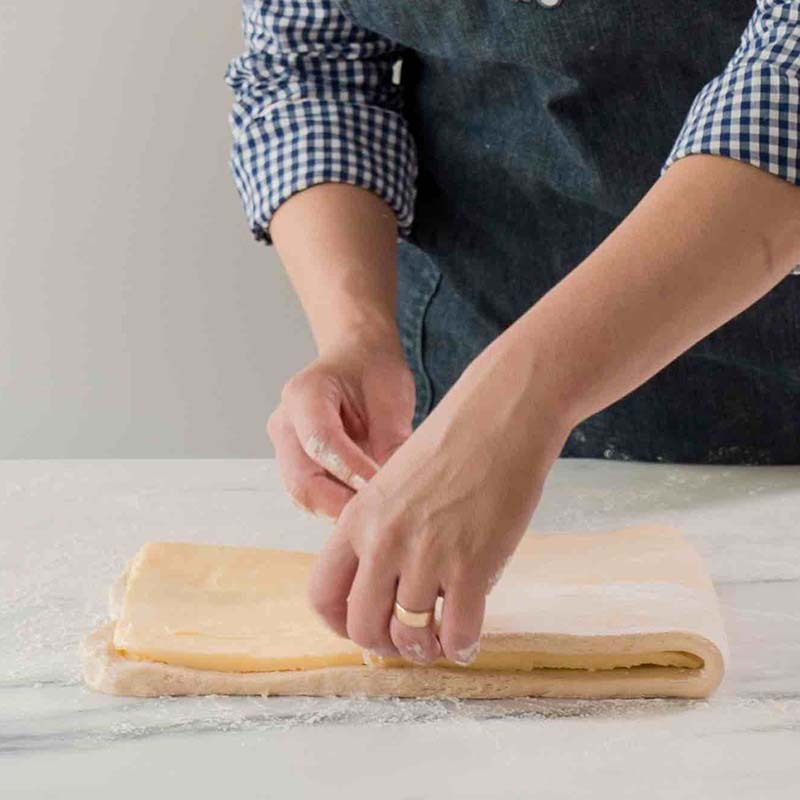 Roll out the dough into a 17x7½-inch rectangle. of dough onto the butter block, to cover half the butter block. Fold the exposed butter portion over, as you would a business letter. Press the edges of the dough together to “lock-in” the butter. Rotate the dough block 90º and roll out into a 24x10-inch rectangle. Fold the rectangle like a letter, into thirds, into a “letter” fold. Cover with plastic wrap and place in the freezer for ½ hour and then transfer to the refrigerator for 45 minutes. 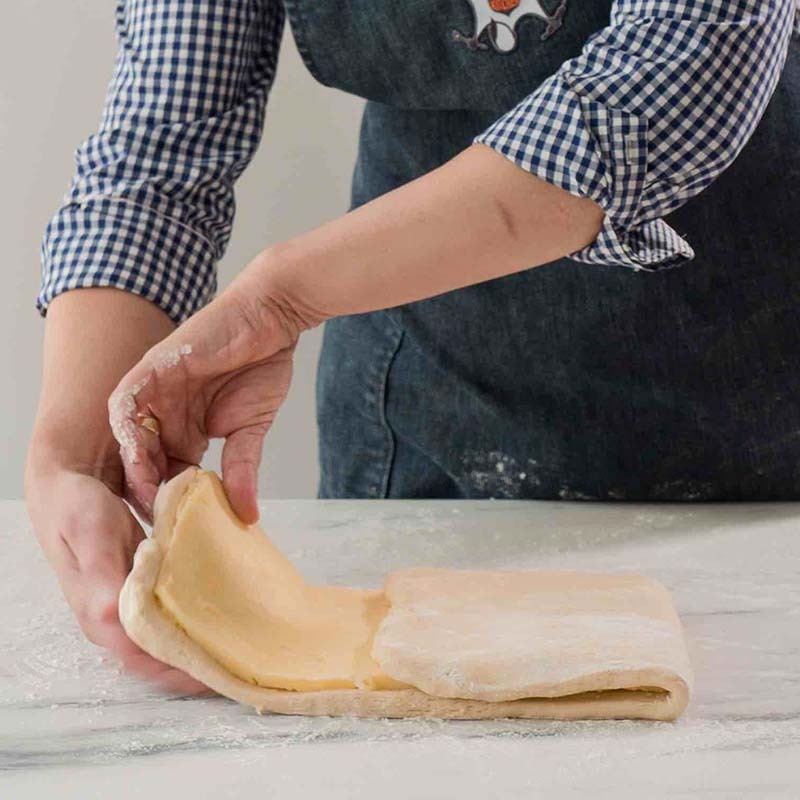 Dust the work surface with flour and roll the dough again into a 24x10-inch rectangle. make a “letter” fold as before. Turn the dough 90º, and repeat the rolling, sugaring and folding process. Wrap the dough in plastic wrap and freeze for 30 minutes and then transfer the dough to the refrigerator for 45 minutes to 1 hour. Lightly sprinkle a work surface with ¼ cup sugar. Roll out the dough into a slightly larger than 12x16-inch rectangle, sprinkling ¼ cup of sugar on top and press it lightly into the dough. Trim the sides so that the rectangle is exactly 12x16-inch. Cut the dough into 12 (4-inch) squares. Take each square and press the four corners towards the center to create a little parcel. Spray a muffin tin with non-stick spray. Place the dough packets into the muffin cups. Cover loosely with plastic and allow to rest 30-40 minutes, until just slightly puffy. Preheat the oven to 375ºF. Bake for 25-30 minutes or until the tops are deeply golden brown. Immediately remove from the muffin tins and allow to cool on a cooling rack. Makes 12. 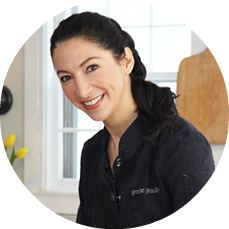 Gesine Bullock-Prado is an accomplished pastry chef, author, and host of “Baked in Vermont” on Food Network. Visit G Bakes! for more of her delicious recipes. 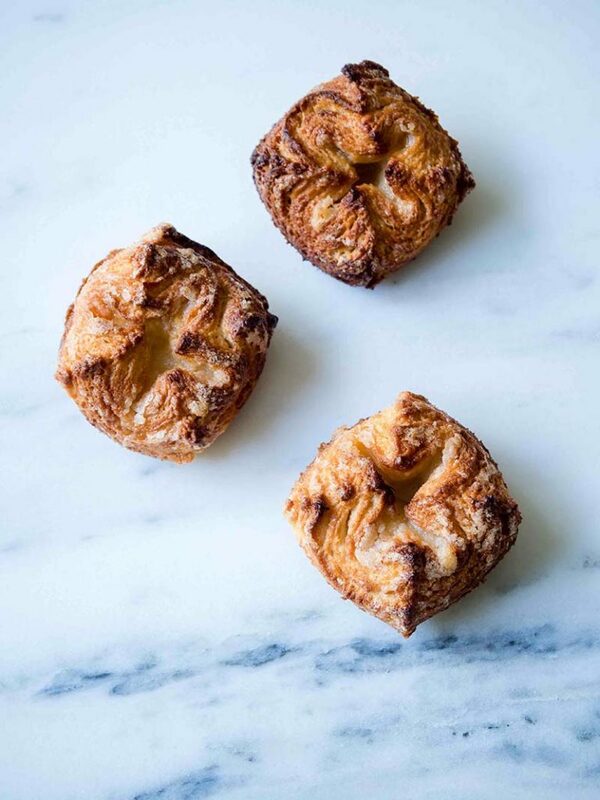 You have provided two different, but similar recipes for kouign amann. I don’t understand why the Maple kouign amann calls for 14oz of butter (for the beurrage) while the stand recipe calls for only 8oz of butter. That’s almost twice as much butter. Both recipes will yield 12 kouign amann. The recipes were created by two different people with different preferences. One just has a more butter than the other. Both will make delicious kouign amann!